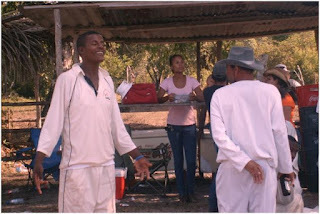 Results of schedule matches played 18th April, 2009 in the Harrison Parks Belize District Cricket Competition. Ø Bright Star Gliksten Bennett top scored with thirty (30) runs all out, A. Vaccero with seventeen (17) runs, Andy Vaccero with fourteen (14) runs, Joseph and Samuel Suckhnandan with three (3) runs each and Elihue Bonner with two (2) runs. Best bowler Gliksten Bennett took two (2) wickets and Elihue Bonner Bowled eight (8) over and took two (2) wickets with fifteen (15) runs scored. uUnfinished Business defeated Reggae Boys all our with fifty six (56) A. Chavez top scored twenty two runs (22) runs, W. Bradley with nine (9) runs. Myvette with five (5) runs. Best bowler, Allwin Dawson took four (4) wickets and C. Chavez took three (3) wickets. Ø Reggae Boyz, David Moody top scored with fourteen (14) runs, Kyle Lewis with six (6) runs, Ian McFadzen with six (6) runs for best bats. Best bowlers Jian McFadzen took Seven (7) wickets and Elvis Moody took two (2) wickets.